The most disturbing aspect of the sorry spectacle of President Bush's last State Of The Union Address -his airbrushed rendering of his Mideast misadventure. As he reminisced about the blue fingered photo-op Iraqi elections and waxed poetic about that nation as some new bastion of freedom in the region, as he boasted of the progress we'd supposedly made buying off support among the different factions, he simply ignored the destructive effects of our policies. Where it concerned the situation in Iraq, the president's address wasn't any realistic accounting of the state of affairs. It was a delusional display of false premises and distorted fantasy. As most all of the previous justifications for invading Iraq have fallen away over the past years, Bush and his supporters have liked to point out, with something of a shrug, that Iraqis (those that had survived) were "better off anyway." They would point to Saddam Hussein's regime and its despotic practices and argue that a better end for Iraq's citizens would ultimately justify the Bush league's somewhat disingenuous means. Yes, and they would ignore the fact that the new constitution we helped engineer largely served to erode civil liberties (once understood to actually constitute "freedoms") for women and religious minorities. NPR's Anne Garrels reports that "women's rights groups report that in the past six months, more than 100 women have been killed in the city of Basra for wearing make-up or what is deemed Western clothing. Those who dare to defend them have also been attacked and, in some cases, killed." "I have just talked to Prime Minister Maliki, and he has asked me to pass on his thanks to you for what you have done to help rebuild the democracy of Iraq." That's the new British Prime Minister Brown speaking to Britain's coalition troops as they stood down and ceded security in the Basra region to Iraqi control. As our own president applauded himself the other night for having "al Qaeda on the run" in Iraq, he neglected to point out they weren't an established presence in the country prior to our invasion and occupation. 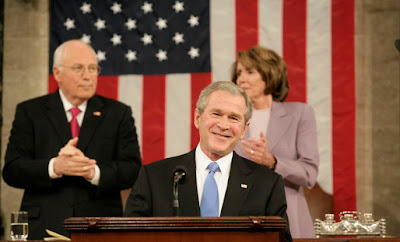 As he praised Iraqi tribal elements for turning against bin Laden's militants, he neglected to mention that this change of heart was helped along by large amounts of U.S. money and our sanction of local autonomy for the Sunni militias -that, in opposition to Iraq's own central government. American policy in Iraq has been to effectively arm both sides of the internal sectarian divide and to then arm those neighbors in the region who might hedge our bet if that game gets out of hand. The majority Shia's cultural ties to Iran have made democracy (per se) problematic in Iraq from the start. But in Bush administration thinking that's nothing a few large arms sales to Saudi Arabia can't counterbalence. The final insult (perhaps that's wishful thinking) came in news just one day after the president's State Of The Union rhapsody on "trusting" and empowering" the people through the forthright practice of democracy. The president used his self anointed "signing powers" to ignore a bipartisan congressional mandate against establishing permanent bases in Iraq. The president "cashed the check" so to speak, as he signed a defense appropriation, but as he did, he announced he would ignore that part of the legislation that contained language barring permanent bases. Yes, he signed the bill, but then "clarified" that he won't "allow" Congress to erode his powers as commander-in-chief. As I pointed out in an earlier posting, the president has seen fit to make our military commitments in Iraq simply inextricable. The final irony (again wishful thinking) is that the Iraqi parliament (elected by all those jubilant blue-fingered folks, you might recall) had passed a law barring Prime Minister Maliki from signing his country into such agreements, too. Maybe there is some consistency in George W. Bush's conception of democracy after all -and, sad to say, it is contageous.